Heat oven to 350°F. Spray pie plate, 9x1 1/4 inches, with cooking spray. Cook and drain fettuccine as directed on package. Beat egg and butter in large bowl with fork or wire whisk. Stir in fettuccine and 1 cup of the cheese. Spoon mixture into pie plate; press evenly on bottom and up side of pie plate using back of wooden spoon or rubber spatula. Toss spaghetti sauce, meatballs and bell pepper in large bowl. 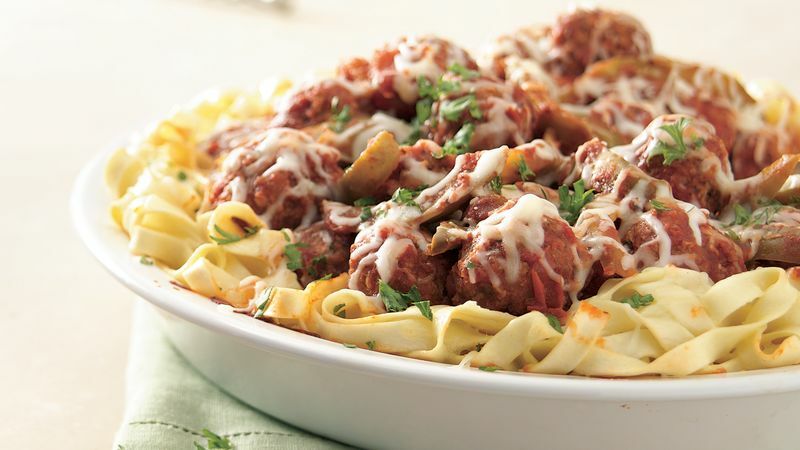 Spoon meatball mixture into fettuccine crust. Cover with aluminum foil and bake 45 minutes. Sprinkle with remaining 1/2 cup cheese. Bake uncovered about 5 minutes longer or until cheese is melted. Sprinkle with parsley. What used to be called “spaghetti sauce” is now most often called “marinara sauce” because its uses stretch far beyond spaghetti. Either sauce will work, and the flavor choices are endless! The pie is covered with aluminum foil to keep the edge of the crust moist, not dry and chewy.